Feeling a tad nervous about buying your first home? As it’s often the largest purchase a person will make in their lifetime, feeling stressed is completely normal. The process of moving into your new home isn’t quite as easy as just picking up the keys. From doing your research and seeing what you can afford, to finding the right mortgage, contacting a conveyancer and liaising with a lender, there’s a whole bunch of things to check off. Here, we’ve broken down the process, so the journey to home ownership seems that little bit easier. If you’re buying your first home, it’s highly likely you’ll need to apply for a mortgage. Typically, you can borrow four times your household income. Money Saving Expert has a great guide to figure out how much you can borrow. Add this figure to your deposit and you’ll get a fair indication of what price bracket you should be searching within. 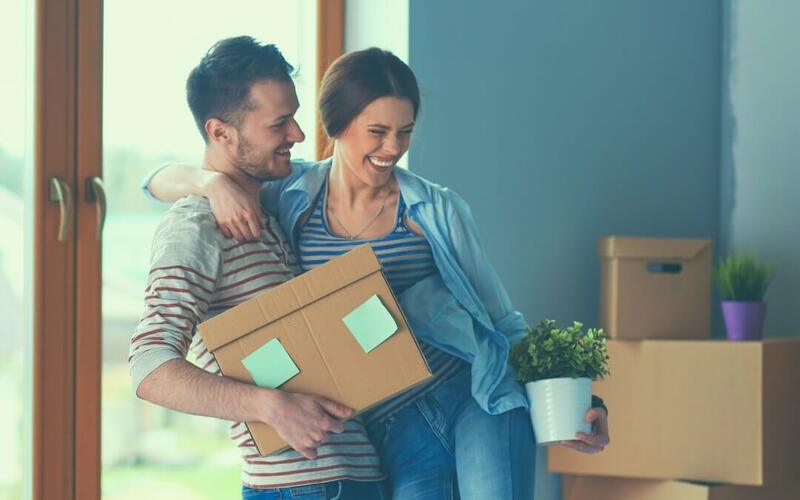 If you’re cash-strapped, it’s also important to keep in mind the government schemes available to help you buy a home: Help to Buy: ISA and Equity Loan are two schemes worth looking into if you’re a first time buyer. There’s also a range of extra costs that are crucial to consider if you’re new to the home owning realm. These include conveyancing fees, building insurance, moving costs (such as hiring a removal van or company) and any repairs or improvements that need to be made on the new house. Once you’ve got a budget in place, figure out what the maximum is that you can spend. This will be especially helpful at house auctions, so you’re clear on the price you’re bidding towards. Before you start seriously looking at properties, it’s best to kick off the process of applying for a mortgage. A lot of people end up missing out on their dream home because they leave the mortgage application process to the last minute. Most sellers prefer a buyer who is further down the mortgage application process, as this reduces the risk of delays. If you’re confused about the technicalities of mortgage applications, this guide can help. It’s helpful to know your credit score when you’re researching different lenders, because this will affect the mortgage deals you’re offered. Your credit history is held by companies called Credit Reference Agencies (CRAs). The three main CRAs in the UK are Experian, Equifax and TransUnion – under UK law, they all have an obligation to provide you with your credit details, for free. You can access your credit report either online or request for a copy to be posted to you. When you eventually approach a lender, they’ll perform a credit search on you. They’ll then come up with an “agreement in principle” or “decision in principle”, which are figures that, in principle, they’d be able to lend you. You can then compare between different lenders. One of the biggest decisions of all is whether to buy a freehold or leasehold property. Freehold means you own the building and land outright. Leasehold, on the other hand, means you’re leasing the property from the owner, usually for a set period of time (this is most often upwards of 75 years). Leasehold properties commonly occur within apartment complexes or blocks of flats. Because of the more restricted ownership rights for the buyer – such as being unable to make major changes to the property without permission from the owner – leasehold properties are generally cheaper than freehold. But while the outright cost of a freehold property is generally greater, you won’t have the annual ground rent obligations that come with purchasing a leasehold property. It’s good to get a feel for the neighbourhood your future home is situated in. After all, you’ll most likely be spending a lot of time in your local area. It’s important to observe what parks are in the area, where the nearest hospital is, where you’ll be able to shop and what schools are around you. Can you get on a train easily? What stations are nearby? Are there well-connected bus routes or cycle paths near your home? These are all questions you should be asking when you’re on the hunt. Check whether car parks are on-street, in a driveway or in a garage. If the parking is only on-street, are there time restrictions or permit costs? While it’s lovely to have outdoor space, maintenance is also a consideration. Do you have time to mow the lawns? Or can you afford for someone to do it for you? If you’re considering a property without outdoor space, consider whether you’ll resent this in the long run: do you need space for a vegetable garden? Is there a patio where you can have a cup of tea in the sun? Whether you’re hoping to grow your family or simply want to have friends over to stay, it’s important to consider you’ve got enough room for your future life, not just your current situation. If you’re hoping to make changes to the property in future, then it’s good to research whether you’re legally allowed to make changes. So, you’ve made it to the exciting part. Making an offer on a property. This is a big step, so it’s important to approach it calmly and rationally. If you feel you didn’t get a good enough idea of the space the first time around, request to view the property again. What’s included in this property? Ie. What fixtures and fittings come with the offer. What’s the property worth? Research what similar properties in the area have sold for and how many are on the market. What are you willing to pay? Perhaps your offer may be rejected. If so, what is the highest you’d like to pay? Once your offer is accepted, you can ask the estate agent to remove the listing from any online portals and to stop actively marketing the property. You’ll then receive a letter from the estate agent which outlines your offer in writing. Following this, you may decide to take out Home Buyers’ Protection Insurance. It protects you if your seller changes their mind about accepting your offer. It also allows you to claim back some of the conveyancing, surveyor and mortgage/lender fees, if the sale falls through. This is the part where we at Beaumont Legal can help you. Our role is to do the legal work of transferring the ownership of a home from the seller to you. We’ll identify any title or planning issues and carry out any searches that need to be done. We’ll sort out the exchange of contracts, and complete the process of changing ownership. How much will the conveyancing process cost? We like to keep things transparent. If you use us as your conveyancer, we’ll be upfront about the fees, right from the start. Use our Online Quote Builder to get a quote estimate, before you even begin. If any extra fees arise throughout the process, we’ll keep you in the loop. Ready to get your conveyancing underway?